Try to call up a childhood memory of riding the merry-go-round: the lights, the mirrors, the band organ playing circus tunes. Do you remember what the horse you rode looked like, how well its musculature was delineated, or what was carved behind the saddle? Can you visualize the art on the structure itself, such as gargoyles and paintings of landscapes? You probably can’t recall the specific details, which is why you might not realize that some carousels are more magical than others. In a certain window of time, carousels were intricate, breathtaking works of kinetic art. And, like most things, over time new merry-go-rounds became standardized factory products. 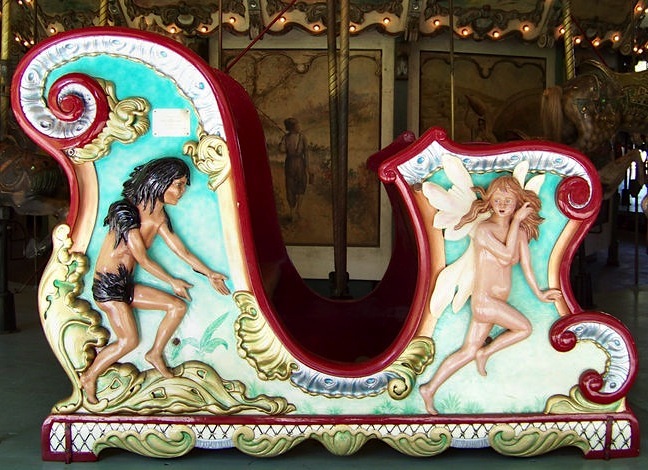 A handful of companies, such as The Carousel Works, are bringing the art of the hand-carved wooden merry-go-round back, but their unique artworks are outnumbered by the mold-made fiberglass carousels, which are cheaper and quicker to produce. 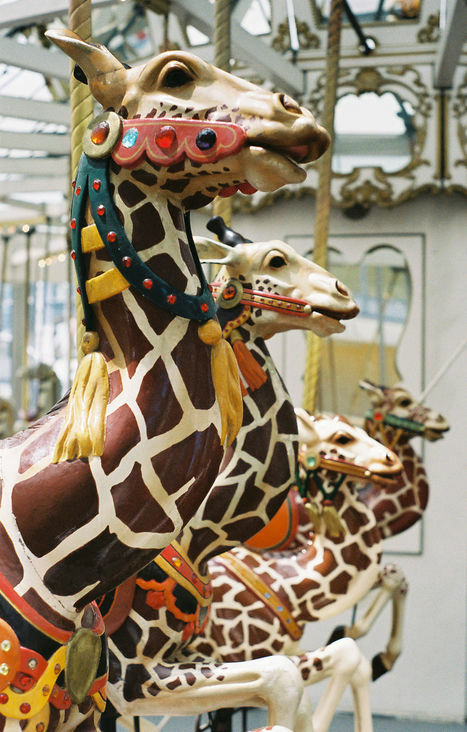 Today, the original antique carousels are endangered beasts. At the height of the Golden Age of Carousels (1890s-1920s), somewhere between 2,000 and 3,000 hand-carved, hand-painted merry-go-rounds were spinning around the United States. Now, there are only 150 of these antique carousels in operation. And experts estimate that there are only a dozen left that could be restored to their full glory. Part of the reason for that is the collectors’ market for hollow-bodied wood carousel animals as sculptures took hold about 40 years ago. 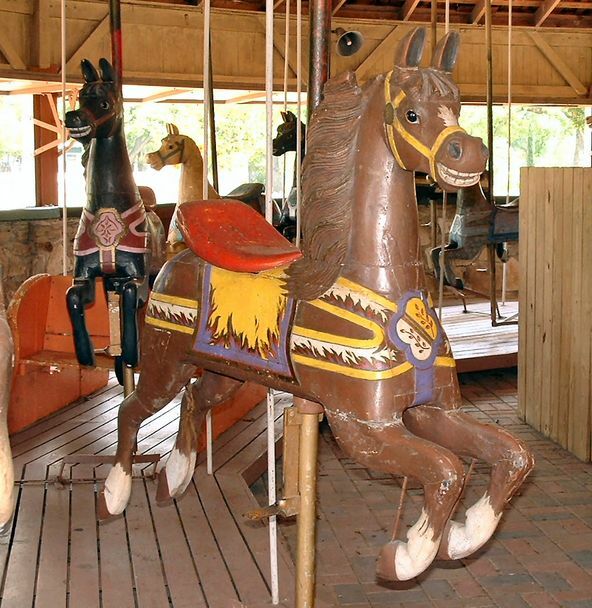 It quickly became more lucrative to sell antique merry-go-rounds piecemeal rather than to restore an entire carousel, getting its mechanisms working, and bringing it up to modern safety standards. 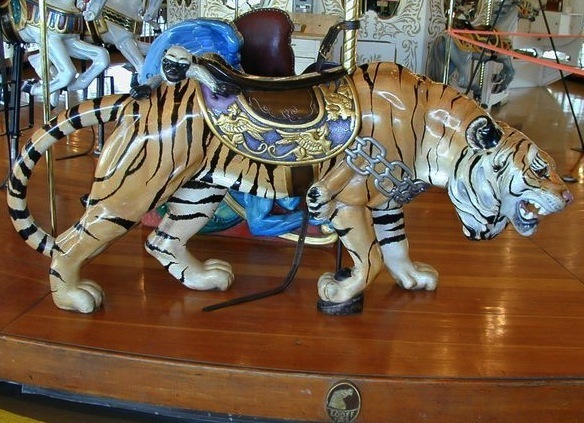 Rare antique animals, like the three-of-a-kind “Sneaky the Tiger” designed by master carver Charles I.D. Looff, sell for five figures today. In response to this alarming trend, carousel lovers, preservationists, and history buffs got together in the 1970s and formed the National Carousel Association. 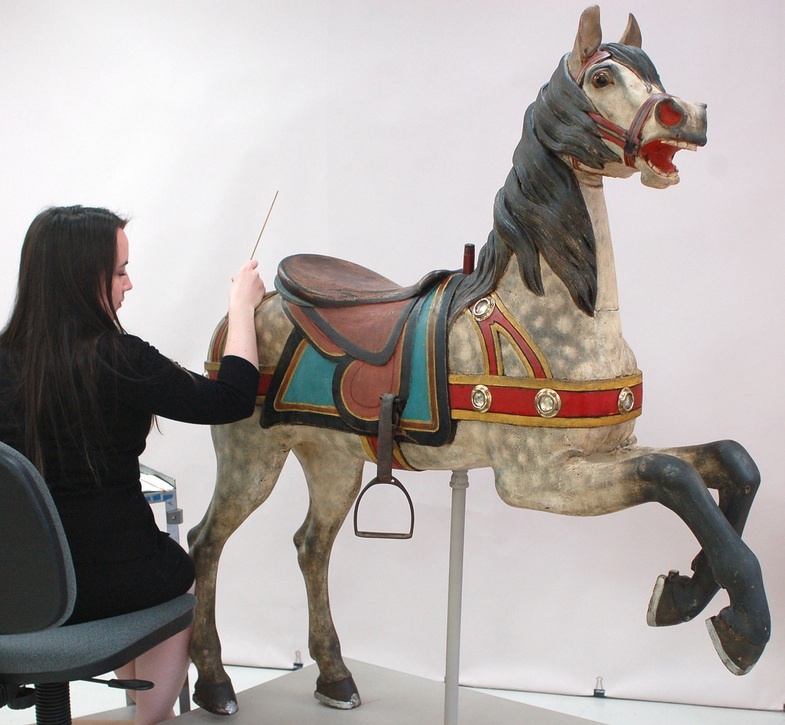 Forty years later, the NCA is still advocating for full-carousel restoration, but has made peace with the collectors, who have also increased awareness about carousel history, knowledge of how the animals were made, and sometimes donated their collections to museums. “Initially, our goal was to stop the breakup of carousels,” says Bette Largent, the association’s president. “The public wasn’t protesting the phenomenon at the time because most people lacked knowledge of carousel history. That is still a primary goal of ours. But we also accept the fact that those carousels that were broken up back then are broken up, and the collectors will have their own world. They collect them, they restore them, and they help us educate the public on topics like carving styles and so on. 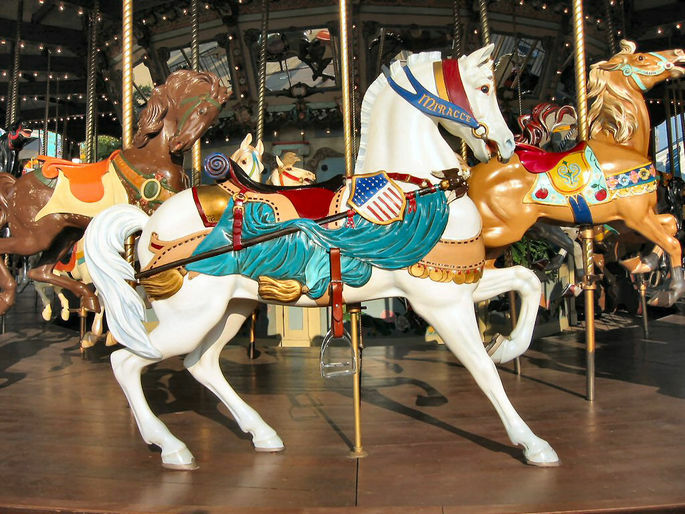 The name “carousel” derives from “carosello,” an Italian word for “little war,” referring to a medieval game Turkish soldiers used to play on horseback. They’d form a circle and toss a perfume-filled ball at one another, trying to keep the ball from bursting. After the Crusades, English and German soldiers brought this concept home, but adopted it as a way to train knights on spearing with their lances. Eventually, European armies came up with a hand-pushed mechanism, featuring four saddles hanging from a cross, and boys who wanted to become knights would ride it to practice spearing a metal ring with their lances. By the 1800s, hand-cranked and horse-driven carousels were built exclusively for amusement, with hand-carved wooden horses, and the inventions of steam and electric power only made these rides more enticing. Spearing practice became a game to grab a metal ring, and if the ring you grabbed was made of brass, traditionally, you’d win a free ride. It wasn’t until these European craftsmen made their way to the United States in the late 1800s, that they really had the time and resources (as in, vast acres of virgin forests) to explore this art form to its fullest. Master carvers took the opportunity to express their whimsy in wood. The carvers that immigrated to America took special care to make their horses believable, with the muscles, movement, and facial expressions of the horses they knew. “The men who carved these saw a lot of different horses every day, they knew horses intimately,” Hessey says. “Outside their carving studio, dray horses pulling wagons would be going by all day long, and the carvers would see people riding through the park. Master carousel carver Marcus Illions had a favorite horse that was an Arabian, and a lot of his pieces looked very much like an Arabian, with that fire and vitality that the breed has. 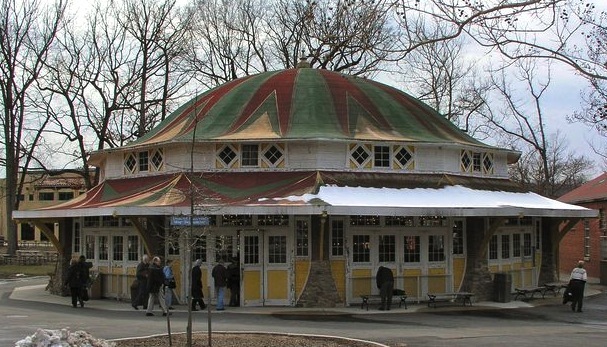 Often, the most elaborate carousels were designed for parks at the end of trolley lines. These parks, which also featured live pony rides and band shells for live music, were popular during Victorian and Edwardian times, when workers only had Sundays to amuse themselves. Three distinct styles of carousels were born in America: Two for permanent park carousels, and one for merry-go rounds built to travel with carnivals from town to town, across the countryside. The styles can be distinguished by not only the bodies, manes, and tails of the horses, but also the embellishments of their trappings—the harnesses, saddle blankets, and any other ornamentation, such as hoods or small creatures lurking behind the cantles, the raised backs of saddles. “There were three companies in Philadelphia—the Dentzel Company, Muller Company, and then the Philadelphia Toboggan Company—that made park carousels,” she continues. “Philadelphia style is the most classic and realistic, and the carousels got very complex and detailed over the years. And they often did not have any glass-paste jewels on them. 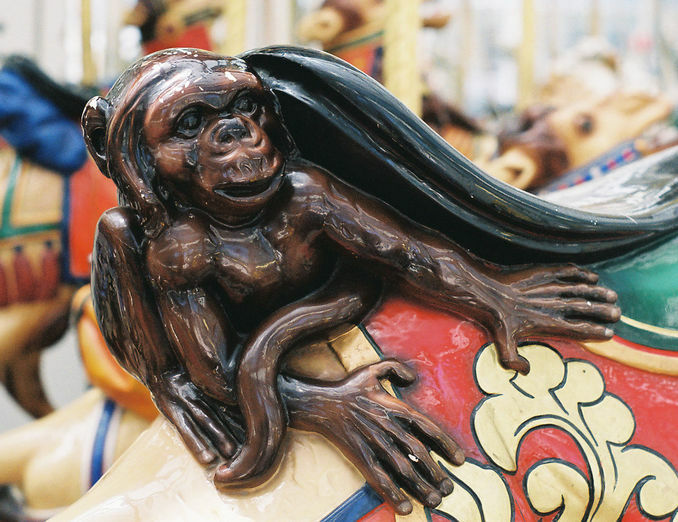 The way the animals moved on carousels evolved over the years, too. Horses on the earliest carousels hung from chains or poles, and as the carousel turned, the horses would fly out from the center. This “flying horses” concept became the basis for the modern chair-swing ride. Later, a revolving platform was added to the bottom of carousels, and the animals and their poles would be affixed to it. Finally, another mechanism was invented that allowed animals connected to the platform to move up and down. This “flying horses” carousel in Watch Hill, Rhode Island, is thought to have been made by Charles W. Dare in 1876. One of the oldest carousels in the United States, this children-only ride was part of a traveling carnival until 1879. The detail and decoration the carvers put into a carousel often depended on what the operator was willing to pay for. 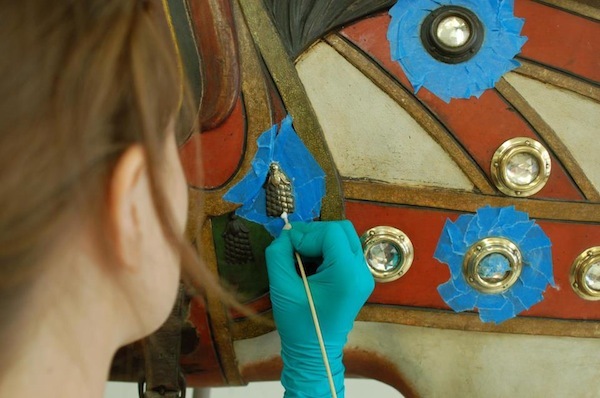 The amount of embellishments on each horse—and specifically, the side of a horse—was also determined by what a viewer looking at the carousel from the outside would see. Horses on the outside row, usually standers, would be the most decorated; and the side of the horse facing the crowd, known as the “romance side,” would be more elaborate than the other side. Because English merry-go-rounds go clockwise to imitate proper riding style, the “romance side” of their carousel animals is the left. 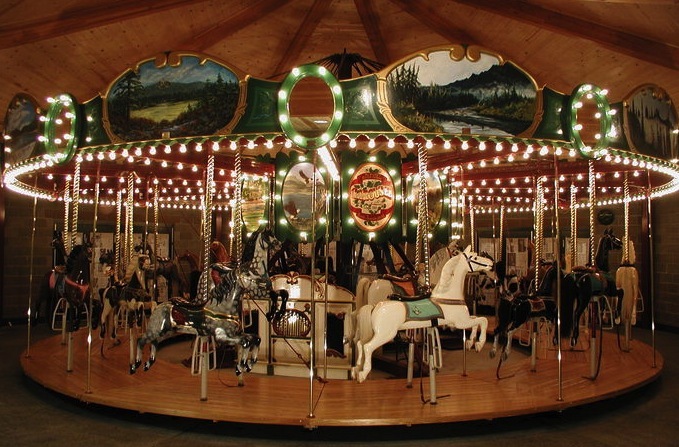 In America, the carousels turn counter-clockwise, so that it is easier for right-handed riders to try and grab a metal ring in the brass-ring game. For this reason, the romance side of an American carousel animal is the right. “The animals on the outside row, they’re the fanciest part,” says Rick Kerschner, a conservator at the Shelburne Museum who has been overseeing the Dentzel animals for 30 years. “Even the non-romance side is fancier than the animals’ on the inside rows. An animal on the outside row will have the mane carved on both sides of the head. Whereas the ones in the very inside row, the non-romance side won’t have the mane carved because nobody sees it except the operator who’s standing. And of course, that’s labor-saving and money-saving. The public didn’t demand that they be fully carved on that side. Even though the Shelburne’s Dentzel has three giraffes, three deer, three goats, a lion, and a tiger, the menagerie animals are way outnumbered by the horses (about two dozen horses in this case), which is true of all antique menagerie carousels. That’s why those animals are coveted by collectors. 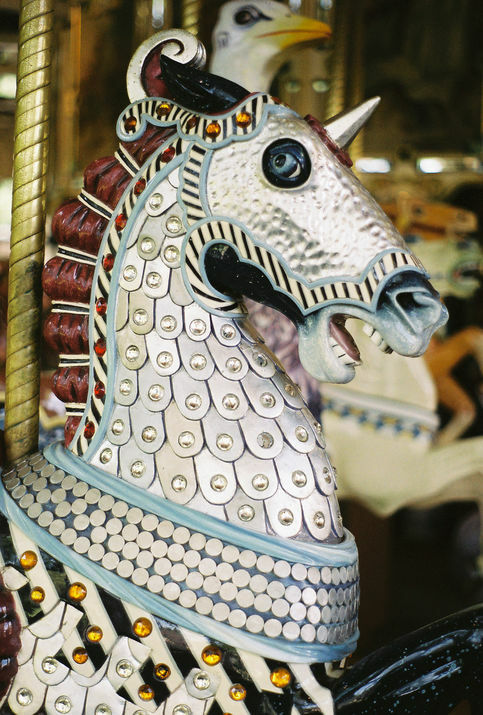 Besides menagerie animals, one of the most collectible creatures on a carousel is the lead horse, which is the showpiece of the machine. “Often, a carousel has an extremely fancy horse, and sometimes the company would sign it or it would have a banner going across the chest that would say ‘Philadelphia Toboggan Company,’ that kind of thing,” Hessey says. Like any antique, the artistry of a Golden Era carousel also serves as a time capsule, reflecting the sensibility of the decade it was made in. “Many of the immigrant carvers were classically trained, and they brought their nation’s personality, their style of folk art and color schemes, to the carousels,” says Bette Largent of the National Carousel Association, who restored and now manages a 1909 Looff carousel in Spokane. “Then, as the carvers progressed in creating the American style, they also followed the colors that were popular of the day. The early ones had a Victorian look; the horses were painted in dark colors and lavished with braid and paste jewels. Italian carver Salvatore Cernigliaro, who worked for the Dentzel Company, specialized in carving figures like gargoyles on the side of animals, chariots, and the carousel’s decorative trim. Company owner and master carver Gustav Dentzel was known for making particularly realistic animals, so his 1902 carousel animals at the Shelburne have authentic touches, like real reindeer antlers on the deer. The trappings on a carousel animal might have a specific theme such as a knight’s horse. When King Tut’s tomb was opened in 1922, Egyptian-themed animals like sphinxes and camels became popular. And the animals were not the only piece of artistry on these antique carousels. The rounding boards placed outside the carousel’s upper frame, as well as the scenery panels covering the machines inner turning mechanisms, were painted with lush landscapes and adorned with lights, mirrors, and sometimes wooden relief sculptures. 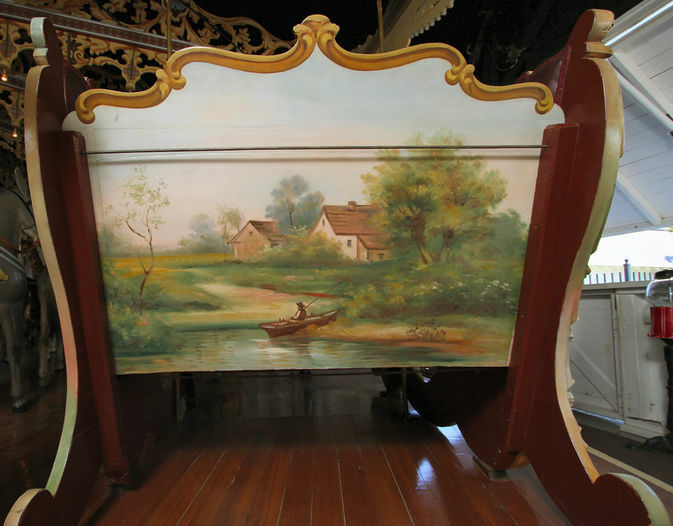 Park carousels were often accompanied by self-playing band organs by the likes of Wurlitzer and A. Ruth & Sohn, which blared loud popular music while the merry-go-round spun. These elaborate hand-carved machines, which often feature wooden automatons moving to the music, were works of kinetic art themselves. The country-fair carousels, produced by Herschell-Spillman Company in upstate New York, and C.W. Parker in Abilene, Kansas, were far more simple. In fact, the design of the horses tends to be fairly uniform and resemble pieces of folk art. But Parker’s system for moving these horses was quite innovative. 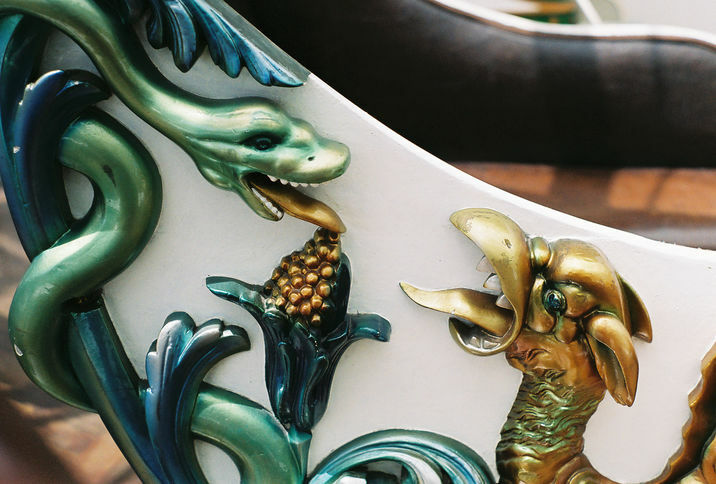 For all its innovation, the Golden Age of hand-carved carousels was bound to come to an end. In the 1910s, World War I and a series of forest fires created a shortage of carveable wood like basswood, while natural disasters like floods or fires took many of the early carousels. And the carousel started to fall out of fashion in the 1920s, as roller coasters and other thrill rides spread to amusement parks all over the country. Most towns with these quaint Victorian trolley parks existed thanks to factories, and these parks would be shut down as factories closed and cars grew more common. But the nail in the coffin was the Great Stock Market Crash of 1929. Only the Philadelphia Toboggan Company, the Herschell-Spillman Company, and C.W. 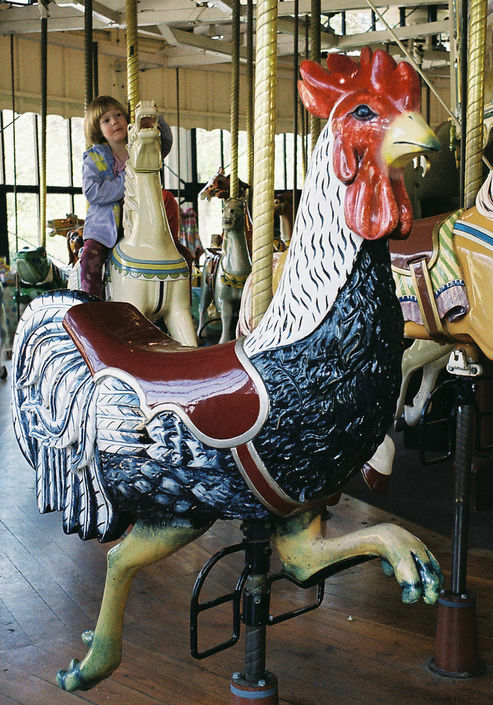 Parker kept making carousels through the 1930s. While merry-go-rounds didn’t hold the same thrill for adults as they had in the Victorian days, they were still popular amusements for children, as well as the elderly, who couldn’t handle the newfangled thrill rides. When the war ended in 1945, new carousel companies got going, this time, making horses from cast-aluminum, and then fiberglass—the first modern-day carousels most commonly seen at county fairs and carnivals now. Antique merry-go-rounds didn’t come into focus again until the carousel animals became collectible in the 1970s. When they became valuable, owners decided it was worth it to dig them out from their shuttered buildings. 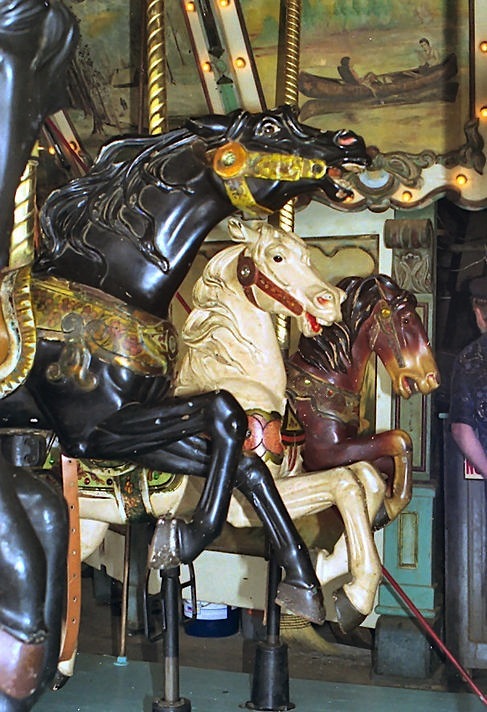 According to Rick Kerschner, it’s particularly rare for an antique carousel to have only its original layer of paint, as the 1902 Dentzel carousel animals at the Shelburne do. So 20-some years ago, the Shelburne conservation staff started cleaning off the linseed oil, which Kerschner says looks like “tobacco juice.” Using Q-tip and solvents, a Shelburne summer intern needs a full two months to completely clean one animal. The interns finish cleaning two animals a year, and now only six out of 40 are left. 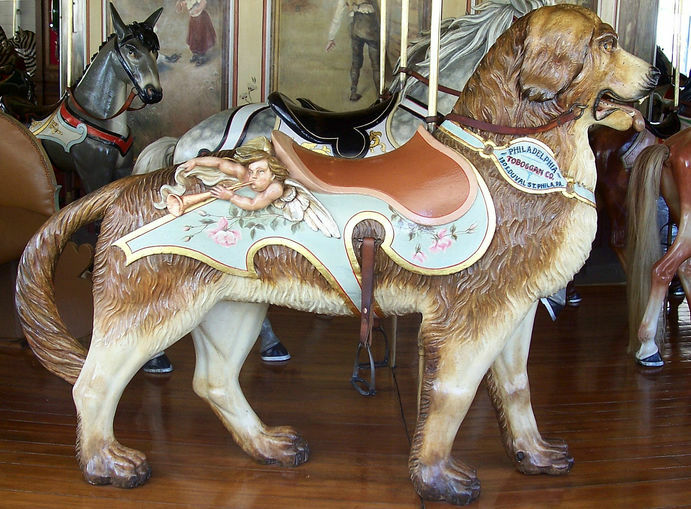 Around 10 years ago, Kerschner and his team approached the board members, and asked them to “adopt” a carousel animal. For $2,000, a board member got to name the animal and watch its restoration process. Eventually, the price of adoption was raised to $2,500 an animal, and now the only Dentzel “orphans” left are the chariots and rounding boards. At Hawk’s Eye Studio, Hessey does restoration for private collectors, who let her know whether they want the animals to look brand-new or antiqued and worn. Depending on what they want, she might repair the wood and seams, prime the animal, and repaint it—unless it has original paint and she’s talked the owner into keeping it. She’s also worked on antique merry-go-rounds at parks open to the public like the 1911 Herschell-Spillman carousel at Tilden Park in Berkeley, California; the 1914 Herschell-Spillman at Golden Gate Park and the 1906 Looff at the Children’s Creativity Museum, both in San Francisco. 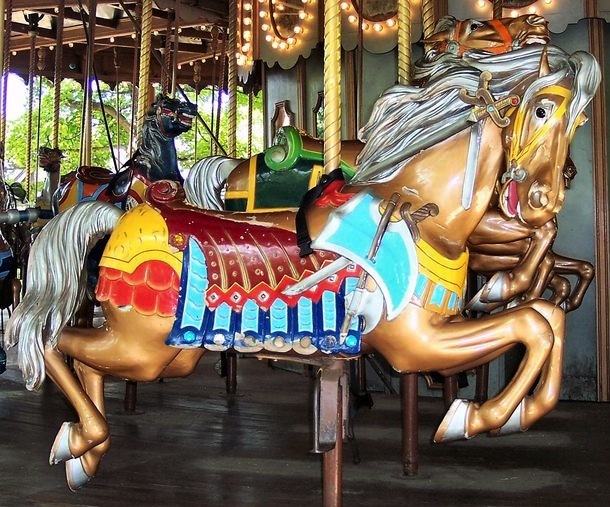 But Hessey understands why an amusement park would go with a brand new carousel instead of choosing to restore an antique carousel, which are much more high-maintenance. It’s difficult to get an antique carousel to meet modern Occupational Safety and Health Administration standards, for example. “It takes a certain kind of park and kind of owner to want to deal with all the red tape of keeping up an antique carousel,” Hessey says. “A lot of the animals have pointy things, like real antlers, that wouldn’t be allowed these days. Kids could put their eye out on those if they’re not careful. The owners either have to take the antlers off or round them off so that they aren’t as sharp. Most antique carousels didn’t have safety belts on them for kids, and some operators put safety belts on them. They’d wrap them around the pole that goes through the carousel animal, but it’s fairly uncomfortable for a little kid to be belted on that close to the pole. The carousels that have been around since late 1800s to the early 1900s, they had round buildings with no fence between the spinning carousel and the crowd, which is considered a hazard now. Plus, when you put an antique to use, it’s at risk for a lot more wear-and-tear. 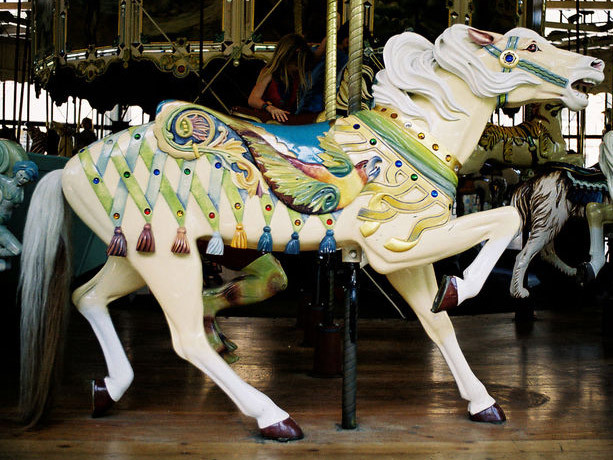 According to Kerscher, the antique animals on the Shelburne Museum’s operating 1920s Herschell-Spillman carousel have to be repaired frequently, to replace chipped or scratched paint and pieces that have snapped off. Climate control is important, too. To keep an antique wooden carousel in top condition, it needs both heat in the winter and air-conditioning in the summer. But Largent says there are plenty of carousel animals now preserved in museums. When an antique carousel is restored to full working order, it always proves worth it, as artists like Hessey and Largent can attest. 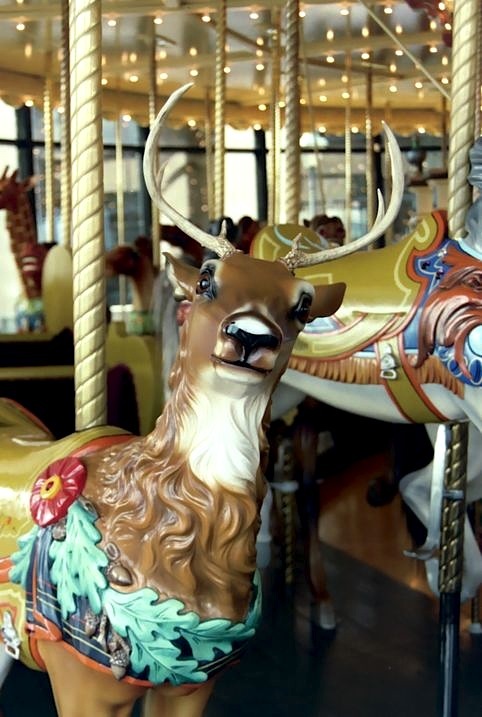 For example, Hessey remembers touching up a carousel in Denver. The park had closed the carousel for the repairs. “A mom came with her kid and he said, ‘Look, she’s painting on Blackie!’” Hessey says. “This kid knew a specific animal, because he came to ride it all the time. Since I had not painted anything on the saddle, I let his mom sit him on the animal. He was so happy, just beaming. He said, ‘I just love Blackie. He’s my favorite.’ Watching this kid smile like that, and the mom beaming, too, it was wonderful. 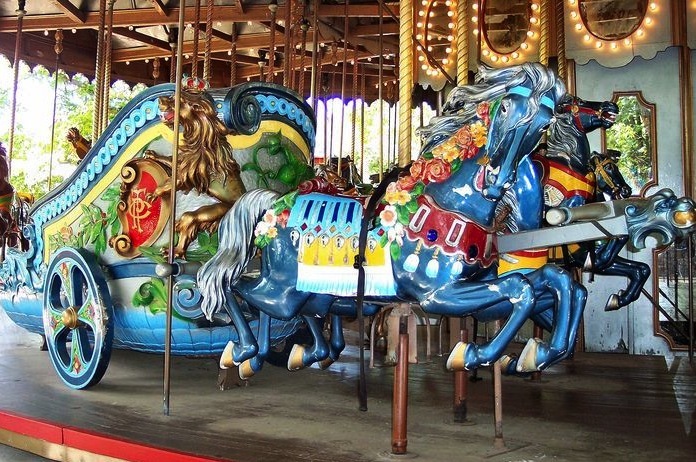 Unfortunately, people who remember riding these antique carousels in the 1920s and have personal nostalgia about the merry-go-rounds of their childhood, are reaching their 80s and 90s and passing away. As a result, the animal-collecting fervor has died down, but the remaining antique machines are at risk of extinction. I enjoyed the article, but why is there no mention of the Merry Go Round at Bear Mountain Park? Alright, it’s not an antique, but it is one of the few more recent merry go rounds which are done the old way, with hand carved animals (most are native animals, but yes, there are horses as well), as well as hand painted sounding boards of early Hudson Valley history. Even the music, which is recorded, was taken from an 1926 Wurlitzer pipe band organ. It’s an amazing piece of artwork (and a lot of fun to ride!). Nice article. I enjoyed the working Dentzel one in Meridian, Mississippi. 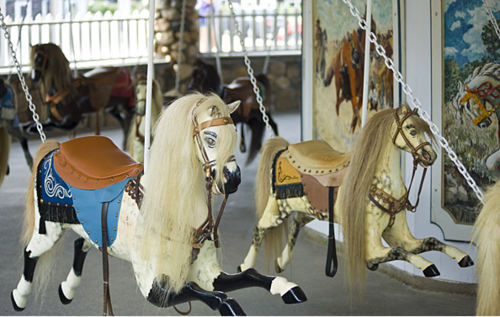 The carousels in the Binghamton area were actually made by the Allan Herschell Co. Check the website above. Great article! Help save an antique carousel. Go to Cleveland Carousel.org to see how the Cleveland Euclid Beach Park Carousel is going to have riders again. 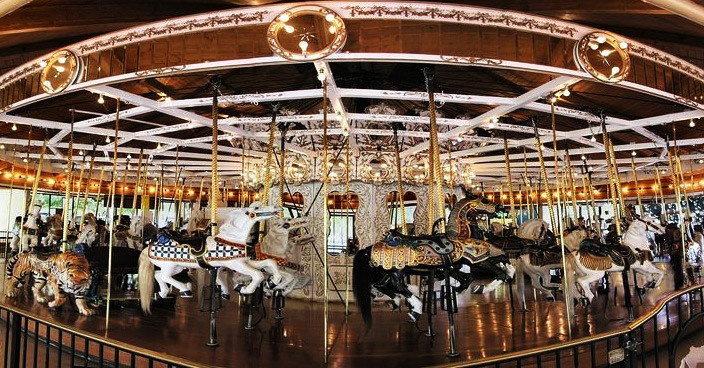 The original 1917 carousel from the park is restored and is now being put in place in it’s brand new glass pavilion that is part of the Western Reserve Historical Society. It is open for visits but will not be ready to ride until 2014. Help us raise the money to get it moving again. Donate $25 to join the club, $200 to put your name on a brick, or up to $100,000 to adopt a horse. Fifty four horses, the original band organ, and lots of the original panels and trim. Contact 216-752-1505 or info@clevelandcarousel.org. Very good, well written article! The eastern Washington state city of Kennewick will soon be installing a gorgeous 1910 Carmel carousel at the Southridge Sports Complex. This carousel has been in storage since the early 1970s, and is now fully restored and ready to bring joy to a new generation. No mention of the carousel in Ocean City MD?! Hand-carved, a variety of animals, real tails on some horses, an odd little rocking seat. Beautiful interior scenery panels. I have a 1925 Spillman two abreast Merry Go Round and have been looking for parts for it for several years now. Everytime I sit down to write and email or send a letter to others for information, I get no replies. Or, if I do get a reply, they want me to bring it out to them so they can rebuild it for me. Well, I’m sorry but I can’t afford to hire it all done. I have to depend on my own tallents to do the work. I have a lot of work to do on it and I have to take my time with it. I’m on a fixed income because I’ve had four heart attacks since 2001. I’d like to live long enough to see at least one dream come true. My Merry Go Round complete and people riding on it once again. What has happened to the carousal that was at a special school in American Fork Utah ? how rare are rabbits? They were not listed in above article. and are they sought after by collectors or museums? What would be their value today? 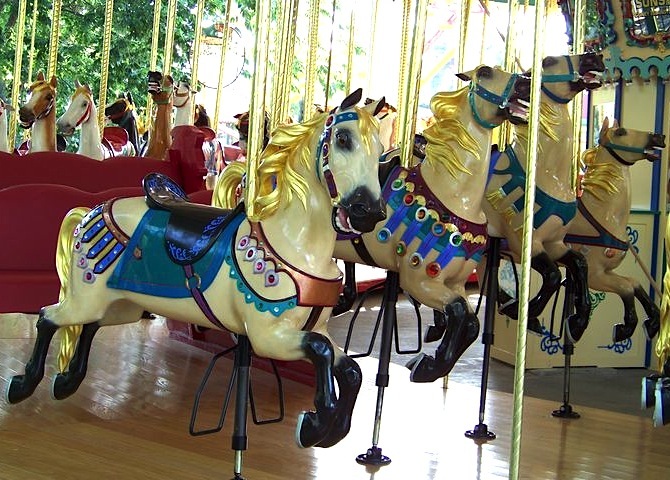 what are the color of the carousel poles? Beautiful carousels. Knoebel’s Grove in Elysburg, PA, has a spectacular carousel museum, as well as two antique carousels, a full-size one, and a smaller children’s carousel. As a kid, my sister & I would go to Rocky Point Park, & take dozens of rides on the beautiful carousel there. We’d pick our horses while waiting in line, & sometimes race to see who would get a favorite. I like the adrenaline rush of a roller coaster, but my heart belongs to the carousel! Save the carousels, the most beautiful ride in the park. I have always loved the carousel animals. I always rode the carousel when I went to the fair. My kids loved them too. PLEASE SAVE THE CAROUSEL!!!!!! I am 69 yrs. old and when my brothers and I were young, we rode many carousel’s in our time. I paint portraits and landscape pictures. I have painted a large carousel, no carousel is like mine. I put different pieces from different carousel together, it turned out beautiful. I remember every part. I looked at the art work when others were enjoying the ride. Love them. Probably one of the nations largest collections of carosel animals is in Hood River, Oregon. A man by the name of Perron has several hundred stored in his barn. 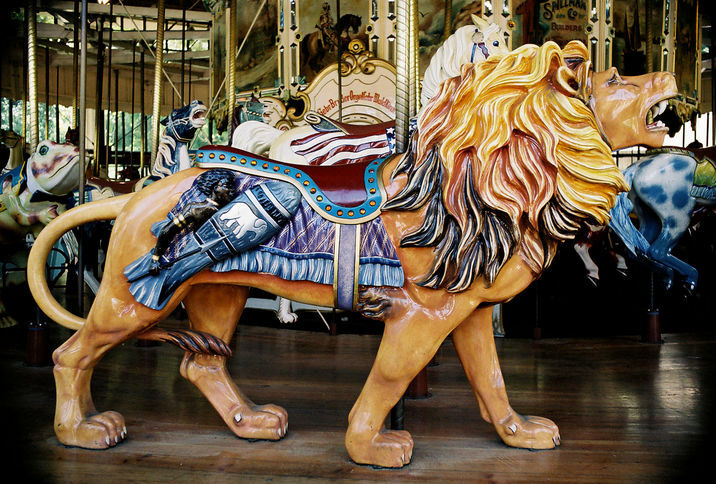 When I was 3, we would ride the most marvelous carousels that I think were in Griffith park, in a grassy glade. One was super fancy while the other was all dark horses, and they raced..riding way up on a pitched floor, and you could grab the brass ring if your horse rose up just right. It was the most fantastic time. I wish there were a photo of those rides. Thanks for your great site. Whose heart does not leap at the sight of these beauties? I do not think they are Charles Dare Carousels in Binghamton. They are Mostly Herschel Carousels. When I was in college in the early 1960s, I worked at Wedgewood Village amusement park in Oklahoma City. I operated a beautiful old merry-go-round that was very ornate. It was brought here from back east somewhere and totally restored. Where is it today? Yesterday I rode on a magnificent 1890s merry-go-round at the Witney Feast in Oxfordshire, a 772-year old fair. It’s often known as Noyce’s Gallopers, having been in the Noyce family for 50 years. In the centre it has a fine pipe organ of great volume and good variety of tone, still controlled by cardboard books. The inner and outer rides are all named horses and the middle set alternates between horses and cockerels. What struck me on discovering your most interesting site is that your animals gallop to the right and ours here in Britain to the left, in other words clockwise when viewed from above. 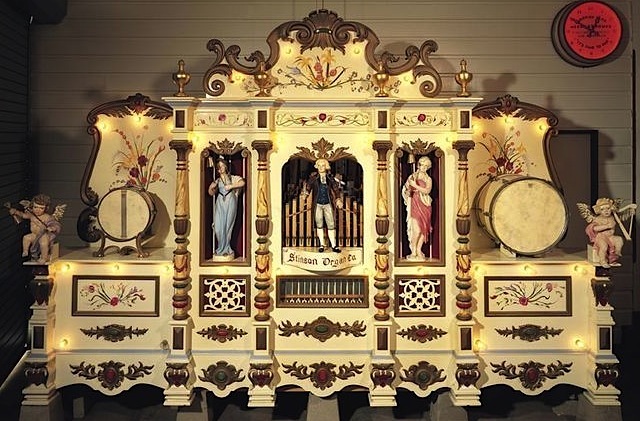 In 1964 I went to a one-off all-steam-powered fair at Shottesbrooke, 9 miles west of Windsor Castle, which seemed to spark off a revival of interest in keeping old rides in good shape and particularly in bringing long-silent organs back to life. Carters of Maidenhead specialise in (almost) all-steam rides, and their road vehicles date mostly from the 40s and 50s. As the days shrink, autumn fairs bring great nostalgic pleasure. during 1950 to mid 70’s my grandparents owned and operated thecarousel at meadowbrook park in Bascom ohio. my generation grew up on that carousel. do you have or know where any of those horses or other figures have gone. I am the proud owner of a dentzel outside row stander. Can someone tell me how to get the value of it? I am an owner of a Denzel pig. I purchased him in the early 1980’s.I had paid a minimum amount of money. (At the time, it was a lot for me) He was appraised at $16,000 in the mid ’90’s .He is in great condition and has been proudly displayed in my dinning room. There is not a day that goes by that I don’t admire this beautiful piece of art. It says a great thing about American culture that there has been a revival in the lost treasure of Carousel restoration, in order to demonstrate American Heritage. I am curious as to both the value of a carousel in very poor condition, which could be fully restored, and that of one which has been restored in its full grandeur. Any educated guesses or knowledgeable experts able to chime in, would be greatly appreciated. Does anyone know what happened to the carousel that was at Fun Town in Atlanta during the 60’s? I know that many of the rides were sold. This one was not real fancy but the horses were nicely carved and it did have a calliope that was run by a bellows. Are there any restored, still working Carousels in Illinois? Thank you. Please visit the National Carousel Association’s website. You will find the census of operating North American carousels there. I am the proud owner of several carousel horses. Three Allan Herschells, a C.W. Parker, and a 1890 Charles Dare. My Dare is the one that makes me smile the most. I have him in my den and I look and him every evening while watching t.v. He has seen a lot of things over the years, but now he has found his “forever home”. I rode the Perkasie carousel in the 1950’s. Just horses, as I remember, but a wooden arm sticking out with the gold rings inside. Don’t think I got one, my arms weren’t long enough. I worked in the poolside snack stand about 1958, and the bath house, for several yrs. Also, I got to operate one of the kiddy rides – I think it was the boats. Spent an enormous time at Menlo Park in the 1950’s. We lived nearby. Rode the bumper cars, played the games of chance, enjoyed the entertainment performed on the stage. What wonderful years!! In Rochester NY we have a beautiful, original Dentzel carousel and organ. It is the only relic that exists from the old Ontario beach park on the shore of Lake Ontario. Recently the city of Rochester decided to remove one of the rounding boards that city officials, and some citizens, deemed racist. The board depicted a black toddler (a characature, typical of turn of the century art) chasing a chicken. It had remained on the carousel for 100 years without complaint until the city decided to cover it and, in my opinion, deface a beautiful work of art. “ ” Cats were fed bowls of white bread soaked in warm milk.